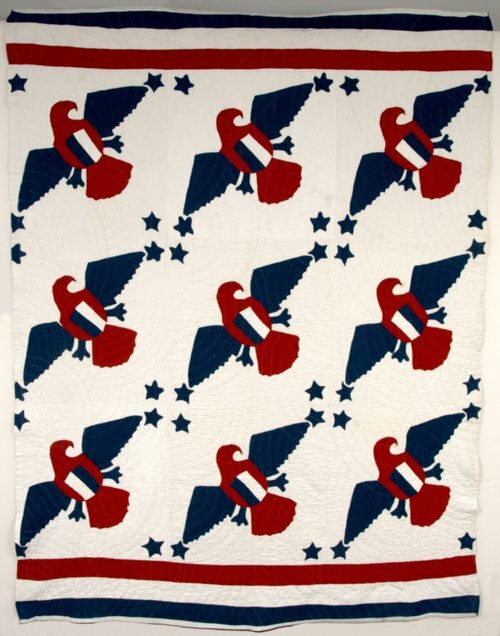 Red, blue, and white eagles and blue stars appliquéd on a white background. Nine eagles, each set diagonally on a separate block. Blue star appliquéd on all four corners of every block. Each eagle has a black embroidered eye and beak opening. Red and blue stripes along the top and bottom edges. Double lines of white quilting stitches in a fish scale pattern. Long edges are folded to back and machine top stitched. Short edges folded to front and machine top stitched. White cotton backing.